The synopsis is sufficient so I won’t resume the story; let’s go directly to what I think of this book. I like the setting in India and the Indian Mythology; it’s interesting to read a book in this country. Maya is a strong girl, despite the horoscope that cursed her, she is very smart and independent. I like the way she acts for the most part, the only time I didn’t like it is when she trusts a person but not listen to her feelings. When she decides to marry Amar and go to Akaran to be a queen, she didn’t expect to rule over a kingdom totally different of Bharata. She took the thing well, but the loneliness is not something to be taken lightly, she hears voices in the corridors, the latter push her to open doors that lead her to dangerous and unknown territories. Amar is an intriguing character; I feel that he doesn’t want any harm to Maya and that he’s in love with her. In spite of everything, I also know that he has a secret, he cannot talk about it and he will be lost. The choices he makes aren’t always the right ones but what his first priority is to protect Maya. The relationship between Maya and Amar is slowly building up, I would have liked more passage only between them but I still liked the attraction that attracts these two young people to each other. This is a story of love and trust, Maya and Amar are perfect together and I love them as a couple. I loved the story, the setting and the characters; Roshani Chokshi has a gift to tell stories that make traveling and dreaming. I’m currently reading A Crown Of Wishes, the second volume and I love it as much as the first if not more. Quick Word: A wonderful story in India with Indian Mythology and a strong woman. 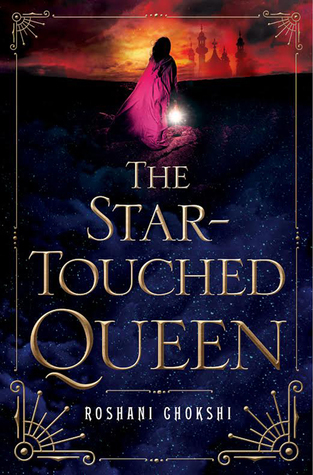 Roshani Chokshi is the New York Times bestselling author of The Star-Touched Queen and the upcoming A CROWN OF WISHES, releasing March 28, 2017. Her work has appeared in Strange Horizons, Shimmer, and Book Smugglers. Her short story, “The Star Maiden,” was longlisted for the British Fantasy Science Award. *I no longer read GR messages, but am always happy to talk to my readers via the contact form on my website or Twitter! *Policy on friend requests: Please don’t be offended if I don’t accept your friend request! I use my GoodReads account a lot, and I get sucked into this Vortex of Angst and Concern whenever I stumble on a reader/reviewer’s status update/review of my book. For my own sanity, I try not to read reviews. When that reader/reviewer friends me, those statuses/reviews become impossible to avoid.